Nicklas Bendtner is a star footballer from Denmark who was sensational in their qualification for the 2010 World Cup held in South Africa. Apart from Denmark he plays for Arsenal, Birmingham city in his club career. Read this article to know more abut Nicklas Bendtner. 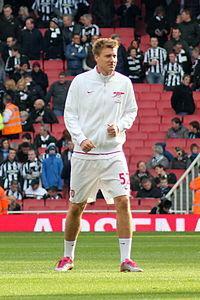 Nicklas Bendtner is a footballer from Denmark and plays for Arsenal English club in his senior career. He has 46 appearances for Denmark in his International career. Bendtner played in Denmark Under-16, Under-17, Under-19 and Under-21 teams from 2004 to 2006. He was the part of the Denmark's Under-21 Team, even after he was selected for the senior team. In 2004, he was the Danish Under-17 Player of the year. Bendtner started his Youth career playing for Arsenal in 2004. His senior career started in a match against Sunderland as a substitute player in 2005. In 2006 he was loaned to Birmingham City to gain experience. He played his first match as substitute and scored a winning goal for the team. He played for 42 matches scoring a total of 11 goals. From 2007-08 season to 2010-11 season, he played a lot for Arsenal giving 99 appearances and scored 22 goals. At the start of the 2011-12 season he was again loaned out of the team, this time Sunderland. He is been the top scorer for Sutherland in this season with eight goals in 27 matches. Bendtner played his first senior match for Denmark in a match against Poland. He scored his first International goal in a 2-0 win in that match. In 2010 World Cup Qualification, he scored three goals which results in the qualification of Denmark in the 2010 World Cup. He was declared as the Danish Football Player of the Year in 2009. He also scored a goal against Cameroon in 2010 World Cup held in South Africa. In 2011, he again becomes a hero for Denmark by scoring three goals for the team in Euro 2012 Qualification. He was impressive against Norway where he scored two goals in 2-0 win.